Custom drama badges for Emily Gammie. 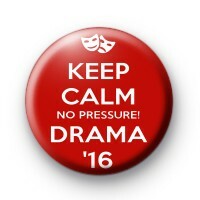 This Drama badge is red with white text reading Higher drama 2016 No pressure. Badge designed to give out to school students. Standard 25mm badge hand made & designed in our UK workshop.